So many of you have read my 'Being a Makeup Artist - Part 1' and you've loved it. So I decided to do a follow up post, that covered portfolio and advertising.. I was someone who was big on taking photos and would forget where I uploaded them or I deleted them by accident. Rooky mistake there Becca. I soon realised that if I wanted to apply for jobs in the industry or even start my own company that I would need to keep those pictures, so I bought a hard drive to store them all on, so I wouldn't lose them... Again. 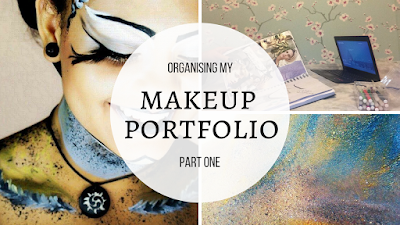 Making a portfolio, whether it is a hardback book, website or even social media. It has to be your best work/edits that you show. Unedited work or not any of your best pictures are not ideal to post or have printed, unless you are showing how you transition from unedited to edited. You should only print the best ones or upload the best ones. I was turned down for so many jobs or they would say we've already seen your work and we don't think you're suitable. I would think about how they have already seen my work even though I hadn't sent anything through to them. Oh yes! Social Media. They have seen my unedited work that I posted a while back and I got an immediate rejection. I soon started a new social media page for all of my edited and best work to go on. I didn't at the time realise that companies can google or go onto social media to find out all about you before you have either attended the interview or been given a response to say that they have accepted your application. The process baffled me until I changed the way I uploaded work or what I wrote. All of my social media pages are public for the world to see, they can look to see what type of person you are just by what you write. Little things like this helped me see the bigger picture on what I want for my future. I have a hardback book and an online portfolio as well as social media. I decided that I needed something printed in case I cant access the internet at an interview or on a job. My online portfolio and social medias are a link for anyone to see who I am, what my interests are , why and what I do with my work. This is something I try to find new ways of doing. I dont think that makes sense but to me it does, so I'll keep it in. Why not? haha. I always want to push the boundaries of what I post or how I connect an audience. I have started to go to wedding shops, hairdressers, florists, bakeries anywhere that people can go in and potentially ask about makeup artists. Its one of the best ways to be contacted. Say you leave a bunch of business cards at a wedding dress shop, someone goes in and complains that their makeup artist has cancelled so they are without an artist for the day. Your card can be given out and then BAM you are hired for the wedding. Social media can be seen by people world wide, so why not advertise who you are on their, what you do and even show what you do. I started to upload videos to my social medias to showcase my skills, I think yeah its good uploading a photo of the finished work but why not upload a video of you doing said work. I have people come up to me in the street and say I seen your video on how to do bushy brows. I wondered if you have spaces at the weekend to book me in for my makeup for a night out. it honestly starts like that. How do you think people like Plouise Makeup Academy are doing extremely well, they advertised on social media. Also handy to have are business cards, links to social media, leaflets, posters and all that jazz. I am going to post a link to my new video about my sketchbook and portfolio. Give it a watch, it is only short but I love it. Hit like and subscribe my loves. I'd appreciate it alot.